Now when it came to my thumb I pulled a lazy that you can only barely see. 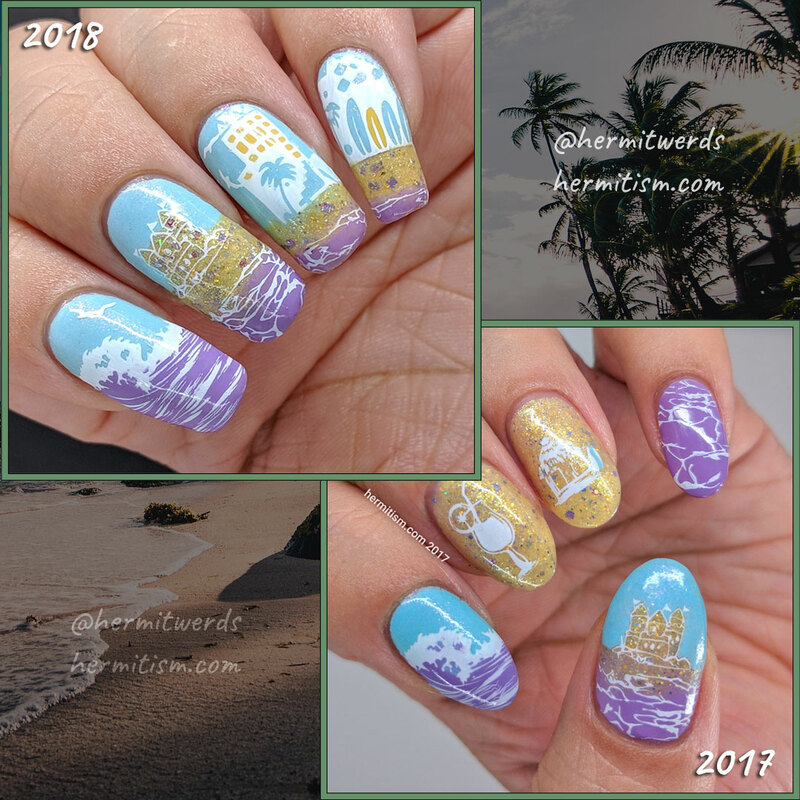 You see, my nails are fairly wide so the stamping images on Bundle Monster’s circle plates do not stretch across my whole thumbnail. So I just filled in the image with purple and stuck it to my nail on the side that would end up in my photos and left it. There’s a whole edge where the lines abruptly end. Laziness achieved! 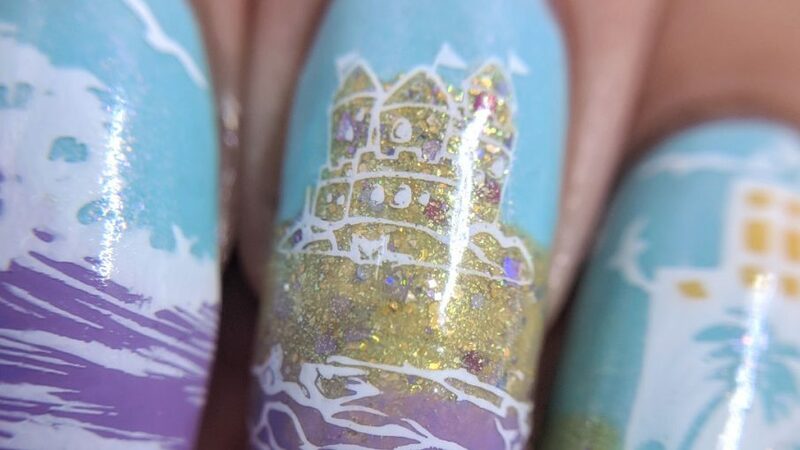 However, if I had been worried about others seeing it, I would have grabbed a second image of the waves, painted clear polish on top, pulled it off the stamper, flipped it, stuck it down on the first image so the lines met, painted more clear polish on top and filled that in when the clear polish was dry. I would still have positioned the image the same because seeing too much of the second stamp would have made it very obvious it was a poorly designed repeating pattern. 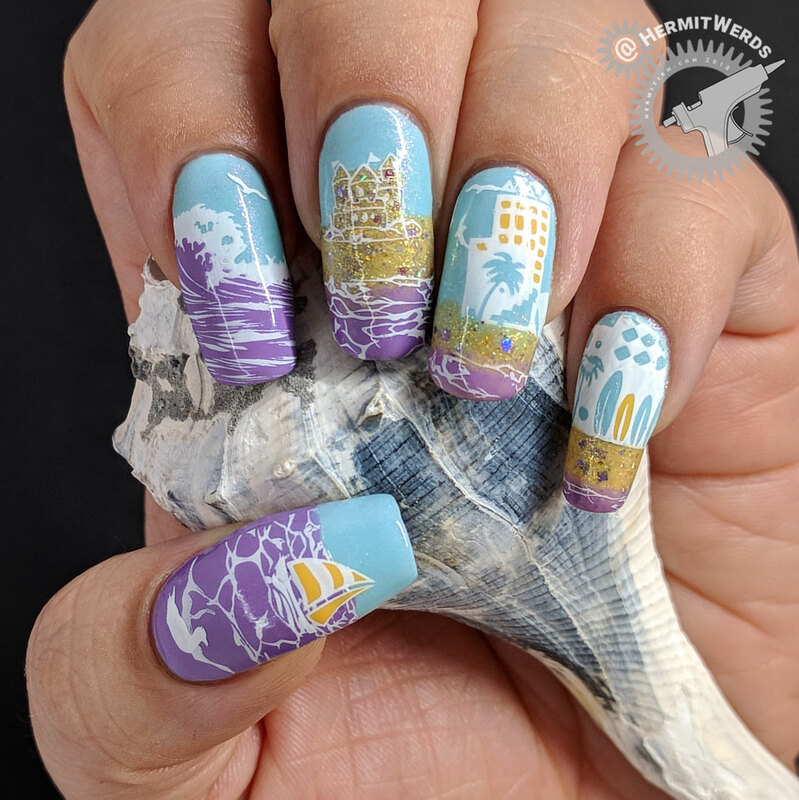 Now if I hadn’t been making it into a decal, I would have used a squishy stamping head, pulled it out of the holder, and streeetched the image by pinching the stamper head as I rolled it across the nail. 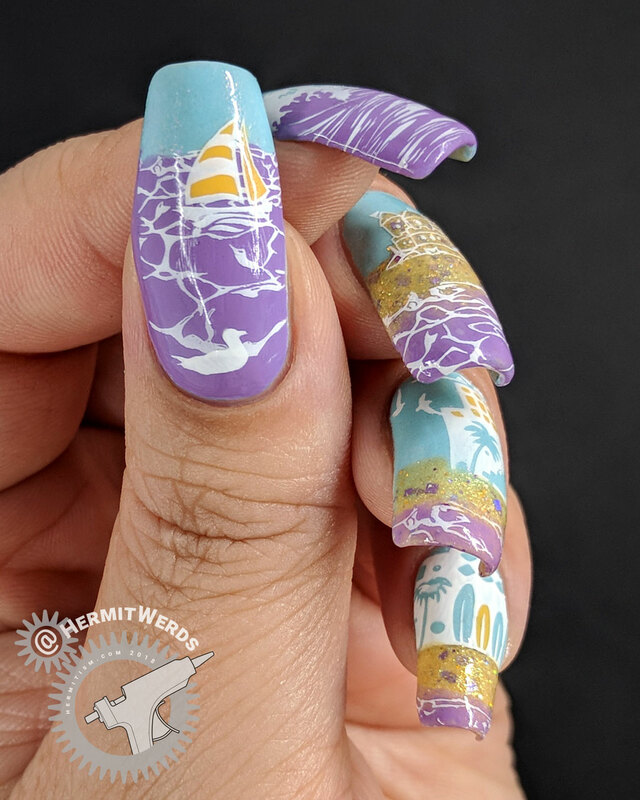 I used this on the background stamping on My Mermaid Has Crabs because the image I wanted to use was so narrow it wouldn’t even fit across my ring finger. This sort of technique works if the stamping image is abstract and organic. I would not use it for anything geometric or rigidly patterned. Definitely not on a picture of something like a cat. You may get it to fit, but it will be a misshapen monster. Layering all the decals was obnoxiously hard. I ended up having to re-paint my ring and pinky nails. I’d initially started by painting all of my nails blue, but I was covering up so much of it that it felt pointless. So on my second try I made full nail decals instead. Then I added the ocean decal on top of that. 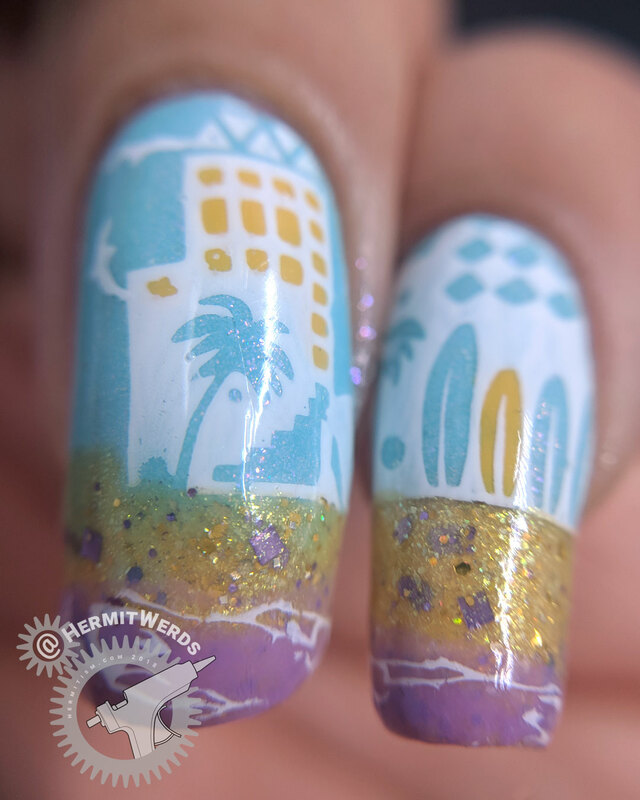 To get the ocean to kind of fade into beach I used clear polish to jelly-ify it into a gradient. I used the same trick on the original and love it still.